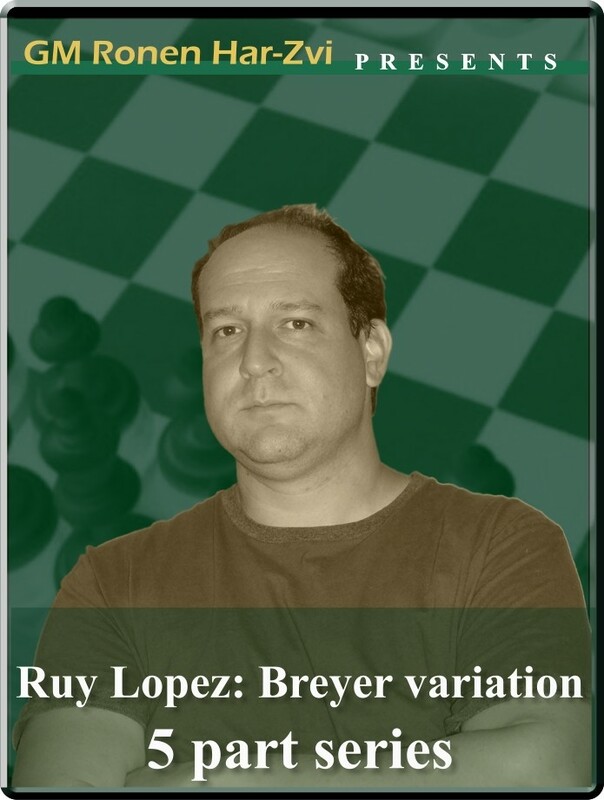 Ronen's Opening Survey: Ruy Lopez: Breyer variation (5 part series). C94, C95: Ruy Lopez: closed, Breyer defense, Ruy Lopez: closed, Breyer, Borisenko variation, Ruy Lopez: closed, Breyer, Borisenko variation 13.b3, Ruy Lopez: closed, Breyer, Borisenko variation 13.Nf1. Hungarian master Gyula Breyer (1893-1921) was one of the leading members of the hypermodern school of chess theory, but is best remembered for the variation of the Ruy Lopez named after him: 1.e4 e5 2.Nf3 Nc6 3.Bb5 a6 4.Ba4 Nf6 5.0-0 Be7 6.Re1 b5 7.Bb3 0-0 8.c3 d6 9.h3 Nb8. This line became fashionable in the 1960s, and soon became a big favorite of ex-world champion Boris Spassky and candidate Lajos Portisch during this period. It also received attention from both Kasparov and Karpov during their mighty duels through the 1980s. It then went out of fashion for over 20 years at the elite level, only to now come back in vogue as a new favorite of Norwegian superstar Magnus Carlsen. And in a new series of Ronen's Opening Survey, our resident theoretical guru, GM Ronen Har-Zvi tells us why we could be going back to the future by switching to lines such as the solid and ultrasound Breyer, especially as the Sicilian gets more and more "engined out". Ronen's Opening Survey: Ruy Lopez: Breyer variation (5 part series). C94, C95: Ruy Lopez: closed, Breyer defense, Ruy Lopez: closed, Breyer, Borisenko variation, Ruy Lopez: closed, Breyer, Borisenko variation 13.b3, Ruy Lopez: closed, Breyer, Borisenko variation 13.Nf1. Hungarian master Gyula Breyer (1893-1921) was one of the leading members of the hypermodern school of chess theory, but is best remembered for the variation of the Ruy Lopez named after him: 1.e4 e5 2.Nf3 Nc6 3.Bb5 a6 4.Ba4 Nf6 5.0-0 Be7 6.Re1 b5 7.Bb3 0-0 8.c3 d6 9.h3 Nb8. This line became fashionable in the 1960s, and soon became a big favorite of ex-world champion Boris Spassky and candidate Lajos Portisch during this period. It also received attention from both Kasparov and Karpov during their mighty duels through the 1980s. It then went out of fashion for over 20 years at the elite level, only to now come back in vogue as a new favorite of Norwegian superstar Magnus Carlsen. And in a new series of Ronen's Opening Survey, our resident theoretical guru, GM Ronen Har-Zvi tells us why we could be going back to the future by switching to lines such as the solid and ultrasound Breyer, especially as the Sicilian gets more and more "engined out".